The stop-over in Trial Bay was really peaceful. Just a bit of a swell to rock us to sleep and no wind to worry the anchor. It would be a very different story in a stiff Northerly though. We left early-ish (7:30am) for the trip up the coast to Coffs Harbour. It's about 35nm and we expected bugger-all knots early but 10 to 15 from the West turning South in the early arvo. It turned out to be less than bugger-all knots almost all day. I think we had the motor off for about 30 minutes in total when we picked up a 10 knot Westerly just south of Nambucca for a while. However, it was quite spectacular with low cloud over the hills on the coast and mirror smooth water to sail through. We'll be staying here until Tuesday or Wednesday morning as there's a bit of weather coming through. On the bright side, it looks like we'll have some nice stiff southerlies on Tuesday to take us up to the Clarence River entrance at Yamba/Illuka. We decided to break up the leg from Port Macquarie to Coffs Harbour by staying overnight in Trial Bay. It's about half way and saves sailing through the night again. We left very early (sorry Terry) to go over the bar while the tide was still in flood. It's one of the strong suggestions made for bar crossings that you wait for a flood tide so that the current is heading in the same direction as the swell. The reason is that if the current is opposed to the swell, it makes the swell quite a lot bigger and encourages it to break. As it turned out, the bar was like a millpond (sorry Terry). We managed about 2 hours sailing with 8 to 12 knots of breeze from the west pushing us along at over 5 knots in a nice beam reach. Lovely, peaceful sailing with just enough wind to move us along nicely and keep us stable in the 1 to 1.5m swells. Then the wind died down and we had to motor again. No big deal as there was no swell to speak of so very little rolly action. Terry retired for a kip while I kept lookout for whales and sang along to some vintage Joe Walsh and Vangelis. No whales were seen today. So it goes. At anchor in Trial Bay. Very peaceful although you wouldn't want to be here in a strong northerly! I have to get another mobile phone. I've had a Motorola Atrix for nearly 4 years now. In fact I've had three of them.. The original took a knock and part of the screen (digitiser) stopped working. I bought another second hand which got dunked in Port Macdonnell a while back when trying to launch the dingy in the surf (which is a really bad idea by the way..) The third was another second hand one which was going really well until it also got dunked in Sydney Harbour just before the new year. I managed to make one good phone out of the three broken ones and that one has lasted a while but finally failed the other day with the digitiser totally screwed. I'm now using another one I cobbled together with a partially working digitiser screen and a fully broken wifi (the phone reboots every time it connects to a wifi network). 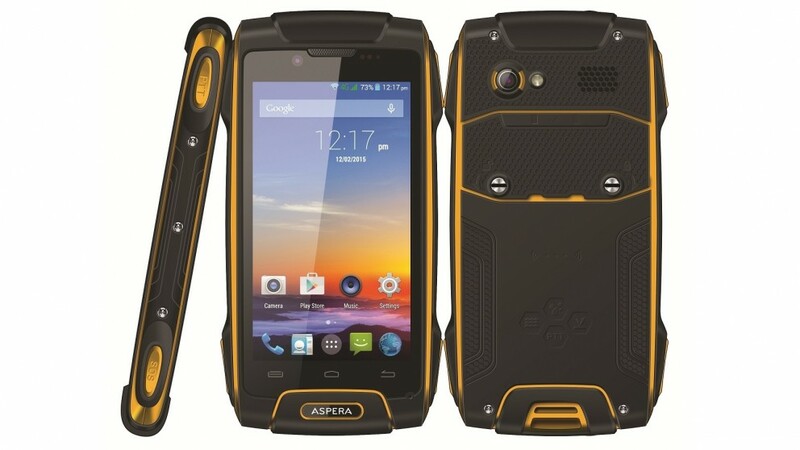 So I start looking for a waterproof phone this time and after a lot of research, decided on an Aspera R6. 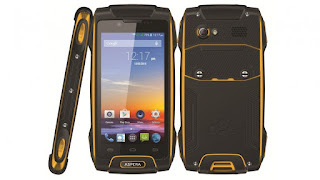 Really rugged and properly water resistant. Just what the doctor ordered! When I bought it I thought this looks very big but for some reason it didn't really worry me as all new phones look big compared to the Atrix. Then I started using it.. It's huge! It's impossible to operate with one hand (and I've got big hands..) and it completely dominates the cockpit on the boat! I'm not kidding, if it floated, you could use it as a life raft! I had trouble getting it down into the boat through the companionway and when I put it in my pocket, I can't bend my leg any more! To watch a video on it, you have to sit at least 3 feet away! Harvey Norman in Port Macquarie were really helpful and didn't bat an eyelid when I sheepishly turned up asking for my money back because the phone was too big. So I'm now doing the research all over again looking for something reasonably rugged, definitely waterproof and that actually fits me. We left Port Stephens on the back of a low. Winds were about 15kts and easing when we left with some pretty heavy swells and local seas generated by the big low that went through a few days before. It was uncomfortable. The problem was as usual, we were out in quite heavy quartering swells with no real wind to stabilise the boat. 15kts is fine normally but it eased to between 5 and 10 pretty quickly and so the boat was rolling, noisy and pretty uncomfortable. Confused and choppy seas close to the heads at Port Stephens. The swell seemed to get bigger overnight instead of lower as forecast.. Poor Terry! Terry did everything right this time taking kwells 30 minutes before we headed off just after lunch and no-doze to counter the drowsiness. But we were both feeling a bit queasy as the sun went down so we didn't eat much, just hot beverages. Terry lasted until 8:00pm when she took her eyes off the very dim horizon for a few seconds and lost her cup of tea. For some reason, she seems much happier lying in the V-Berth when she gets sea sick. This seems counter to my understanding of what is actually happening to the body but it certainly works for Terry so she retired to the V-Berth and I soldiered on through the night with Al Stewart, Donovan, Dave Crosby and Grace Slick for company :-). Terry got up and even though still feeling sick, spent a couple of hours on watch over midnight while I crashed in the sea berth! We made really good time in the end and even turned the engine off for about 8 hours when the wind picked up overnight and the swell dropped. So we got to Port Macquarie a bit earlier than we anticipated so we hove to outside the harbour entrance and dozed for a couple of hours. The leads were great but a bit dim with the sun rising behind us. They use a sector light showing red when to the port of the channel, green when to starboard and white when you are on the money. Crossing the bar into the harbour wasn't as bad as I expected with just the swell to worry about as it was coming from the port stern quarter, slewing the boat sideways as it washed through under us. I soon got the hang of steering through though and ended up looking behind me almost as much as ahead. We decided to treat ourselves to a berth at the Port Macquarie Marina and pulled in just after 10:00 am next to the fuel dock. We moved later in the day to another berth further inside the marina to make room for a chap in his boat with a failed engine who was towed in by marine rescue. From what he was saying, he got water in the fuel somehow and had a bad electrical short when he was trying to bleed the water out to get the motor started again. Boats.. Always something to fiddle with. 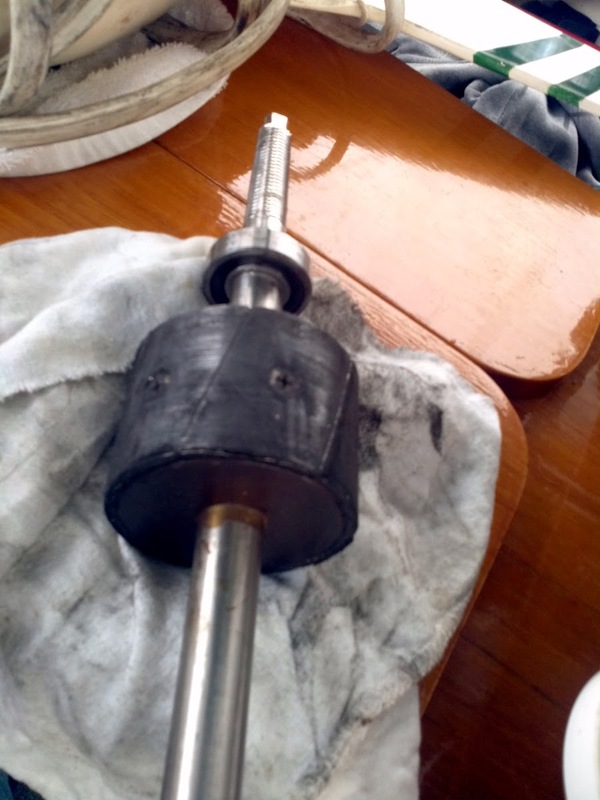 I've added "fix the staysail roller fuler and simplify the air-con/water-maker raw water intakes" to the list of things to do after this short trip. The KISS generator was pretty much totalled by the storm in Sydney. The front bearing stopped bearing and separated into two pieces with some tiny steel balls floating around. This caused the rotor to contact the stator (the two bits that actually generate the electricity) rapidly and repeatedly which is definitely not supposed to happen. The result was overheated permanent magnets on the rotor (demagnetised) and damaged stator. 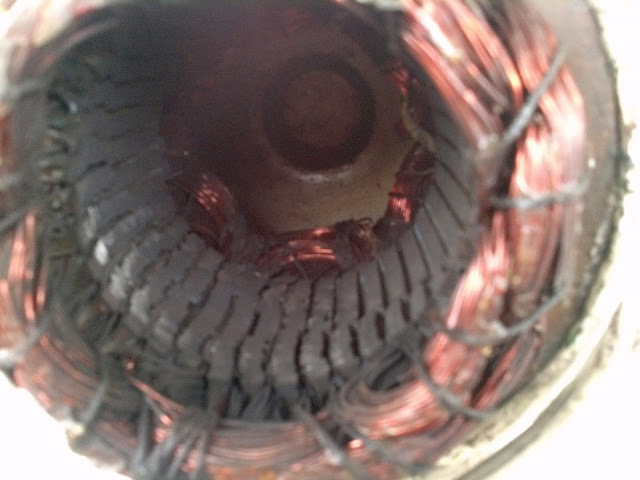 Fuzzy image of the inside of the stator. 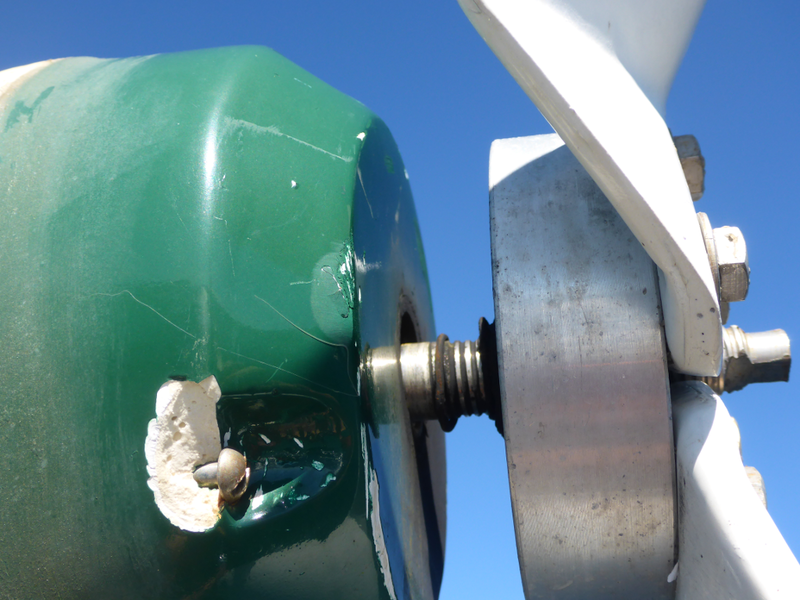 The Steel laminated core has been badly damaged by the rotor contacting it. Fortunately, Jack (the previous owner, bless him) carried a lot of spares for the generator (we actually carry three sets of spare blades..) and the people at Hotwire Enterprise have been really helpful so we will rebuild with a new stator/rotor/bearings and epoxied casing. She will live again, better and stronger! So we finally left the Sydney area! I think we were hanging there for around 6 months in the end. We really enjoyed a lot of that time but it was definately time to move on. We left Broken bay after working up 20 hours on the engine so that Sandy (the diesel wizard) could do the first service for us and headed up to Newcastle for the first leg North. Unfortunately, Terry really suffered from lack of sea legs on this trip. The first few hours were quite nasty rolling through 40 degrees at times with the swell and no wind to speak of to use a sail for stability and Terry literally could not stomach it. But we got there in the end. We met a nice chap (Hi Bruce..) on a Cavalier 32 who stopped by to say hello on the public wharf in the harbour. He has been looking for a cruising boat for a while but is having real trouble finding a boat with 6' 7" headroom (anyone got a clue for him?). That really would be really difficult I think. We only stayed overnight this time but again we were really impressed with the place! It's nothing like you'd expect for a town built around coal exports with really interesting surprises around almost every corner! We didn't get off unscathed after all [edited]..
Well it looks like we didn't come through the storms quite as well as we thought. The wind generator is fully busted. Without getting it down to check, it looks like the insides are a mess. The main shaft has about 10mm of lateral movement so the bearings are totalled and I suspect the rotor and stator are both a chewed up mess. Damaged Kiss Generator. Main shaft has 10mm lateral movement and there is some damage to the casing. I'll get it down when we've finally cleaned up and stowed everything. Parts are available so unless the bearing housings are also shot, we might be able to get it working again for less than a boat unit ($1,000). And we found some significant wear and a hole in yankee. It was partially unfurled by the wind during the storm but it didn't look damaged until we unrolled it fully yesterday. Double bugger! So another trip into Mona Vale with a sail this time and another $300 and 7 days to patch it. The sail maker was not impressed by the state of the sail and said it was badly sun damaged and suggested we'll need a new sail sometime soon.. Double bugger! Hopefully, this is the last of the storm damage and we can head north sometime soon after we get the sail back on the 15th. 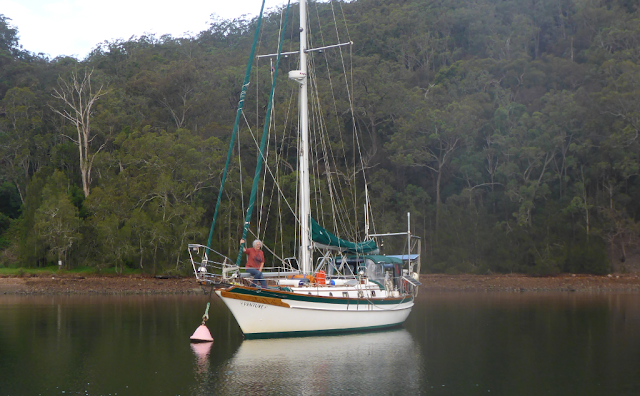 We got back to Pittwater today to find Venture still afloat after the storms and with a new engine! Sandy (our most excellent mechanic) picked us up from John Witchards (marine engineer extraordinaire) and took us to the shops for some supplies before taking us out to Venture and giving us the low down on the new engine. The new engine looks and runs sweet inside a very clean engine bay which is no longer black from soot and even though it's a slightly bigger motor (50hp instead of 46hp), it seems more compact and John's work with marinising the base Kubota engine seems to make it fit better inside the engine space. There's much more room over the top and I can even reach down the front to the bilge below the engine! The old, huge exhaust riser has been replaced with a much smaller unit (no more welding of the manifold flange) and there are less pipes to worry about as the heat exchanger is a part of the exhaust manifold instead of a separate unit. Sandy (the engine wizard) told us all about the record breaking storms that came through Sydney a couple of weeks ago, a very nasty East Coast Low, and showed us some of the damage done in Pittwater. The boat just upwind of us looks a bit sad because it's furler failed and the sail ripped off it. As far as I can tell at the moment, the only damage Venture took from the storm was we lost our house flag, the Garden Island burgee is in tatters, a flag halyard parted (which means a trip up the mast) and some minor wear on one of the headsail sheets.. Incredibly lucky.